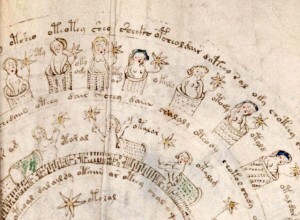 Over the years, there have been several theories written about the Voynich Manuscript ranging from the now-debunked idea it was a plagiarized women’s health book to the most recent scholar’s theory that an Italian Jew wrote it. Regardless, the text hasn’t been decoded, even by an AI–and I’ve formed fresh theories about its author beyond my earlier thought that it may be an alchemical text. I have a facsimile of the folios, and after reviewing all the theories I’ve realized the Voynich Manuscript may have been written by a woman. For background, the vellum has been carbon-dated to the early 1400s, and illustrations potentially place its author in Northern Italy. Okay, so what was happening in Northern Italy at that time? The Italian Renaissance was flourishing despite the long shadow of the Holy Roman Empire and the established patriarchy. While it’s true that belief in witches during this time period was present, primarily among peasants and commoners, keep in mind the hysteria not peak until much later following the publication of the international best-seller Malleus Maleficarum in 1486. Why write an untranslatable book about women’s health during the Italian Renaissance? One that has no overtly Christian or Catholic-specific symbols in it, either? On the one hand, you have an age of discovery and a period of enlightenment. On the other, you have the establishment of the Church and its political might. In between, however, you also have the birth of an Italian feminist movement that began in the late 14th century. Several Italian women of privilege were not only literate, they also taught at university, published books, and participated in the Italian Renaissance as thinkers of their age. Dorotea Bucca was a professor of health and medicine in Bologna, for example, for forty years from 1390-1430. As another example, Christine di Pizan challenged the idea that women were inferior to men by publishing the City of Ladies in 1404. This, dear reader, points to my “who”. Who would be interested in writing a book that emphasized women’s health? One that stretched the boundaries of the knowledge they possessed at the time? Who’d have access to vellum and inks? Who’d have access to women to illustrate and study their naked bodies in a non-threatening, non-sexual way? Answer: an Italian woman of privilege. There is no reason to assume the Voynich Manuscript’s author was male, and I feel that gender absolutely plays a role in the discussion about its author given all that was going on in Italy at the time. If the folio was written by an educated woman, then she has more than one reason to ensure the text is not translatable–especially if she continued to work on the text as time progressed. And, since we know that literary among women was not as widespread, those who were educated would have stood out because their numbers were few. So, an Italian woman of means who wanted to explore the sciences would have just cause to write an untranslatable text that only she could decode. Keep in mind that Yale’s Beinecke Library states that the Voynich Manuscript was written in the 15th or 16th century, and of the articles I read (linked above) this folio was reliably produced before the invention of the printing press. This further underlines the possibility that a woman had yet another reason to hide her discoveries: because there was a growing backlash to the rise in feminism even before the ultra-popular, anti-feminist Malleus Maleficarum was published in 1487. History teaches us that every moment of progress, in this case the Italian Renaissance, is followed by a period of regression. Modern societies weather those periods faster, because the zeitgeist changes at a more rapid rate. Not so in centuries past, for sure. Anyway, this “rubber band” effect caused by a number of factors (including the then-inexplicable plagues) began to target devil-worshipping women as the reason why all bad things were happening; because of that any female doctor, scholar, professor, or healer would be at risk of discrimination or, as the centuries progressed, much worse. Keep in mind the Malleus Maleficarum was not conjured from thin air, and many existing beliefs were drawn upon and extrapolated to fit Church guidelines. (One of the many reasons why this damnable book was so popular.) As one of several examples, the witch’s mark bears a lot of similarities to signs of a bubonic plague infection. All of Europe experienced heavy losses, and when there is no explanation for tragedy and suffering often the most vulnerable populations are to blame. In this case, women. Why untranslatable? As long as the author retains knowledge, then she’s fighting back against that feminist backlash until it’s safer to do her work once again. Having said that, there is another possibility. Drawing from earlier theories, if the text was copied from an existing text (or, as is more likely, several of them) by someone who was illiterate but of means, then the folio wouldn’t make sense to anyone–including the author. The illustrations could have been the author’s interpretation of existing materials, too, so they aren’t a precise copy. Thus, there may be no translation for the text because the author either did not know what they were writing, they had no guidance to ensure the material was copied correctly, or they were not copying the content for accuracy. Here, too, it’s possible a woman who desired to be literate would have been the author. Who else would be drawn to illustrations of herself and want to hold those dear? Who else would take the time to practice lettering? Who might admire a book and long to read it? Well, there you have it. A different take on the “who” might have penned the Voynich Manuscript and “why” it can’t be translated. Sadly, I could only prove this with a lot of time and research. So, for now they’ll remain theories. May my author funds be bountiful so I can explore this further one day. Wouldn’t that be amazing! I blogged about the Voynich Manuscript quite a while ago, and since then I’ve read a few more books on the subject in my spare time(1). Yesterday, I watched a new documentary about the Voynich Manuscript called the “The Voynich Manuscript – The World’s Most Mysterious Manuscript” which addressed its age and speculated as to its author. The conclusion of the documentary was that it was written over the course of a couple of days in the 1420s(2), somewhere in a northern Italian city that had a fort with swallow (or dove) tail battlements. It also claimed that the intent matters, and that it’s possible that the manuscript text is gibberish while the images or not. To me, this text screams “alchemy” for a few reasons, but not necessarily from a scientific perspective. Alchemy was (and continues to be) a blend of the metaphorical and chemical. Images, codes, symbols, and gibberish (which is thought to originate from the Islamic alchemist Jabir ibn Hayyan) were used to explore transmutation and the relationship between the masculine and the feminine. A pregnant woman, for example, was commonly used to represent the moon. So an image that “looks like” a series of pregnant women taking a bath, would (through the lens of alchemy) be the phases of the moon. Their modesty protected, would be apropros of the 15th century–especially if the book was, indeed, written in Italy which was heavily influenced by the mores of the Holy Roman Empire and Catholicism. Timing, in occult terms, was very important to the success of any rite and, for alchemy, the Master Work in order to successfully perform a transmutation that was both physical and metaphysical. While the Master Work itself varied, key principles were often explored between alchemist and pupil or couples such as Nicholas Flamel (Yep, the Harry Potter character was based on him) and his wife Perenelle. Often, in history, women are overlooked and, in this case, I have yet to read a discussion about the aspects of gender in this work which, I feel, are hugely important given the role of gender in alchemic symbology. Hermaphroditic characters, for example, were also used to portray the perfect union between the masculine and the feminine or, as is usually the case, Hermes/Mercury. The fact that so many plants were illustrated in the Voynich Manuscript is a different way of portraying that union, with the plant and its “seeds” being the fruits of an experiment when the Sun (male/heat/sunshine) and Moon (female/cool/water) shines down on the earth. Even so, the images would be based on an amalgamation of what the scribe knew or, in my mind, what that person was taught. Alchemists usually come in pairs, and are performing works that would be construed as heresy and grounds for trial and accusation of witchcraft. While the nobility and wealthy class might somewhat be immune to such claims, they would protect what is known as “The Golden Chain” at all costs. The Golden Chain is the handing down of knowledge from master to scribe and so on throughout the centuries. In my mind, the text could be a combination of gibberish and code. Remove the gibberish, which is known only to the scribe, and the code emerges. I believe this is not the only text that was written at the time, and the book was either intended to be passed down to the next scribe, or was written in exchange for a large sum of money. The folios themselves might even have been bound or collected at a later date. After all, if you are teaching occult knowledge you wish to keep hidden from an Inquisitor, from the scrutiny of the Church, from rivals and greedy nobles who desire what you know–why just write one text if you intend to pass it on? (3) Or, alternatively, if you were paid to write alchemical knowledge by a wealthy noble, why bother worrying about whether or not you were telling the truth? You could generate something that looks like the real thing, without revealing what you actually know? Regardless, one of the things I find interesting about the Voynich Manuscript(4) is the fact that every theory I’ve heard “seems” to be true. I am not certain we’ll ever find proof, but I do feel that the intent–the reason why these folios were produced in the first place–would provide some answers. (1) I tend to read non-fiction before drifting off to sleep. It allows me to clear my head so I can dream about my plots and characters interruption-free. I tend to read fiction in a sitting for this reason, or listen to audio books. (2) Interestingly, 1420 was a leap year which might have had significance in terms of occult timing as well. (4) Hey, some people are obsessed with aliens. Me? I like a good historical mystery to chew on every once in a while. Mood: Is my nerdness showing yet? Caffeinated Beverages Consumed: Not. Enough. Work-Out Minutes Logged Yesterday: 30. Day 8 in a row! In My Ears: Listening to the tail end of a so-so comedy hour. Movie/TV Show Last Viewed: Empire Strikes Back. Latest Artistic Project: Um… Let me get right on that. Latest Game Release: Dread Names, Red List for Vampire: the Masquerade and Ghosts in the Black for the Firefly RPG. Current State of Projects: Read my latest project update and My Departure from the Conan RPG.